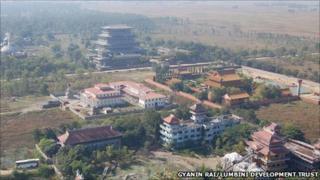 What happened to the dream of a Buddhist Mecca? In the hot, dusty plains of south-western Nepal sits Lumbini, one of the holiest places for about 350 million Buddhists around the world. Centuries ago a baby was born in Lumbini who went on to become the Buddha and many have long cherished plans that Lumbini could be developed into a Buddhist destination, comparable to Mecca, Islam's holiest site. But now buildings sit half-finished and empty fields lie neglected. More than a decade after Unesco designated it a World Heritage Site, Lumbini runs the risk of slipping into obscurity and promises to transform the site remain unfulfilled. The most recent announcement was made by a Chinese group called the Asia Pacific Exchange and Co-operation Foundation, which declared it would raise $3bn (£1.9bn) to develop Lumbini by constructing airports, highways and hotels. But both the Nepalese or Chinese government authorities claim to be in the dark about the grandiose scheme. The group insists that it is preparing a five-year plan to implement their idea of "developing Lumbini like a Mecca city". Yet it is unclear what stage the proposals are at and whether they will truly see the light of day. Another Chinese organisation has proposed building a 100-metre-tall statue of the Buddha in Lumbini at a cost of more than $55m (£35m). The Nepal government has accepted this proposal but the groundwork is yet to begin. It is frustrating for a number of Lumbini locals who pinned their hopes on the resurgence of their ancient and holy home. "We have not seen any significant progress," local resident Abdul Aziz Khan, 58, said. "Some tourists come but they spend very little time in this area due to a lack of facilities. Therefore we locals have not benefited from these developments." There is a master plan for this holiest of sites. It was drawn up in 1978 by Japanese architect Kenzo Tange in conjunction with the UN and with the support of the Nepalese government. The idea was that Lumbini could become home to a massive hub of monasteries, served by transport links that would enable pilgrims and tourists to experience the holy site. It was a plan that required backing that went beyond the meagre resources of Nepal's government. But help has not been forthcoming. Only about 60% of it has been completed. Excavations in the core area of the site, the sacred garden, and construction in the surrounding monastic zone remain incomplete. And the plan to develop the centre of Lumbini, including tourist facilities, banks and security arrangements also remain unfinished. "After the master plan was prepared, there has not been any significant support from the outside world," Kai Weise, a Unesco consultant, says. "When the UN supported in the preparation of the master plan, it was assumed that there would be substantial international co-operation to implement it. But, sadly, that has not happened," says Kosh Prasad Acharya, a former director general of Nepal's archaeology department. He says that the international committee of more than a dozen countries formed by the UN to develop Lumbini is now defunct. Money is at the heart of the lack of progress, says Rajendra Bahadur Thapa Magar of the Lumbini Development Trust (LDT). Mr Magar estimates that the completion of these tasks requires $110m (£69.5m). But the LDT's annual budget is just over $1.5m (£947,850). One local who lives in a village north of Lumbini pinned the blame on the Lumbini authorities. "The Lumbini authorities do not hold any discussions with local people. They have not been able to fufil our expectations of development in surrounding areas. Even inside Lumbini area, their efforts to develop the holy place do not look adequate," Sugrib Yadav told the BBC. The comparison with Mecca is chastening for the authorities in Nepal, many argue. Every Muslim aspires to go on the hajj, whereas Buddhists adopt a different approach. Even so, Lumbini attracted 150,000 only foreign visitors last year - Mecca draws about two million pilgrims annually. The oil-rich Saudi government invested heavily to develop Mecca, introducing extensive road and rail networks. "The site falls on Nepali territory. Therefore, Nepal should have been much more proactive to garner international support," Mr Acharya says. But Lumbini has more than the lack of funds to worry about. The unchecked growth of cement factories in the nearby city of Bhairahawa also pose an environmental threat, according to some observers. "There are cement and other factories quite close by. There is a real risk of environmental pollution affecting the peace and tranquillity of the holy place," Kai Weise says. And Nepal remains embroiled in protracted instability as it makes the rocky transition from conflict to peace. In such times, development has been forced to take a back seat and Lumbini is certainly low on the radar.